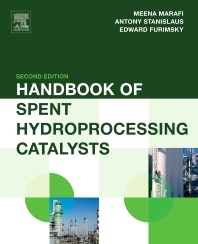 Handbook of Spent Hydroprocessing Catalysts, Second Edition, covers all aspects of spent hydroprocessing catalysts, both regenerable and non-regenerable. It contains detailed information on hazardous characteristics of spent and regenerated catalysts. The information forms a basis for determining processing options to make decisions on whether spent catalysts can be either reused on refinery site after regeneration or used as the source of new materials. For non-regenerable spent catalysts, attention is paid to safety and ecological implications of utilizing landfill and other waste handling and storage options to ensure environmental acceptance. As such, this handbook can be used as a benchmark document to develop threshold limits of regulated species. Dr. Marafi received her Ph.D. in Chemical Engineering from Aston University/England. Her areas of specialization include: petroleum refining/processes and catalysis, catalyst deactivation, regeneration, rejuvenation and recycling, crude oil assay, petroleum characterization and catalyst development. Dr. Marafi has over 88 publications, including, 2 books, 25 papers published in refereed journals, 25 papers presented in international/local conferences, and 36 reports (technical reports/final reports/progress reports related to projects carried out). Lead 14 contractual projects in the area of petroleum refining and catalysis. Dr. Stanislaus has over 30 years of research experience in catalysts and processes related to petroleum refining. His research experience includes: upgrading of petroleum residues by catalytic hydroprocessing, deep desulfurization and aromatics hydrogenation of diesel blending streams (clean fuels production), naphtha catalytic reforming for octane improvement, kinetics of hydrotreating reactions, catalyst deactivation and regeneration, spent catalyst reactivation and utilization, catalyst development, characterization, and performance testing. He has published over 100 scientific papers in International Journals and books. Dr. Furimsky has some forty years of research in the conversion of petroleum, coal and natural gas to various commercial products. The studies on upgrading petroleum feeds included hydrodesulfurization, hydrodenitrogenation, hydrodeoxygenation, catalyst deactivation and regeneration. The environmental and safety aspects as well as utilization options for spent refinery catalysts were part of the research as well. Scientific productivity includes two books, several book chapters and a dozen of reviews on various aspects of hydroprocessing catalysis, petroleum refining and utilization of refinery residues. Some 130 articles appeared in the referred scientific journals.